Boy, as her dad, is it ever fun to watch Elisabeth sing. She’s usually not the most confident person in the world. She gets pretty nervous before violin concerts (even though she’s great!) or she gets overwhelmed by her studies (even though she’s a smart kid). But when it comes to singing…Wow! She doesn’t get nervous before a big concert in the park (see video below) and others lean on her for confidence. She’ll sing almost any genre, even rap, and if the band starts too high, she doesn’t get nervous about reaching outside her range. Look at that girl, is she having fun or what?! Elisabeth started a German bilingual high school this year. That means the students spend their first year in intensive German study and then in the following years they have some classes (like history) in German. So the first year of German is pretty important and pretty challenging. Elisabeth is so used to challenges by now, though, we thought we should spice things up and spend the first half of the school year in the States (see paragraph above about self-confidence to detect sarcasm here). When we returned in February, she was a half year behind her classmates and dove in head first, trying her best to catch up. She did her best but was still behind at the end of the year. That spells a summer of German for Elisabeth. Every free day she’s reviewing all the material they covered last year and she’s especially reviewing German vocabulary. She’s working hard and we hope she’ll be caught up by the beginning of the school year. I already wrote about the unexpected opportunity that Elisabeth had to go on the first ever short term missions trip from Slovakia to America. Along with the trip to Nashville, Elisabeth got another unexptected opportunity in August. 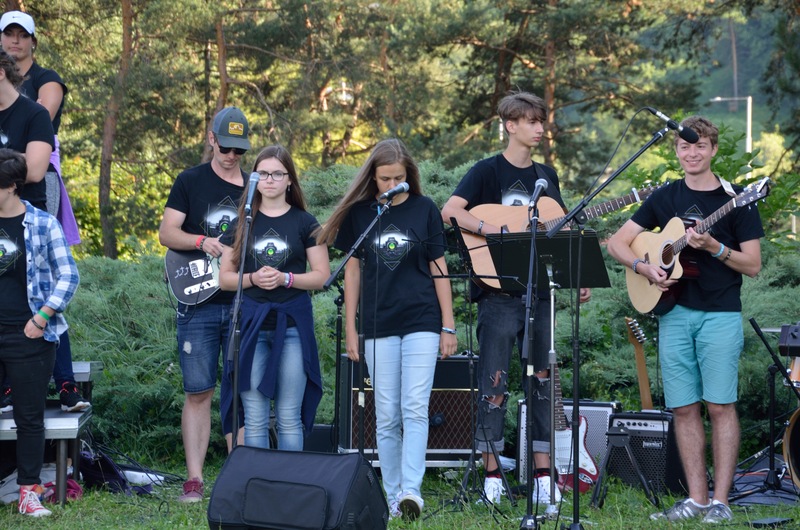 A team of missionaries came from Switzerland to do street evangelism, prison ministry and outreach to Slovak Roma communities. They needed someone to help their team translate from Slovak to English and having some German would be a nice help. Great parents that we are, we signed her up. In case you didn’t know, just because you know two languages doesn’t mean you’re good at translating from one to another. Last year Elisabeth had a not so great experience and even though she was willing to sign on to help the Swiss missionaries, she was nervous. A great thing happened in the meantime, though. 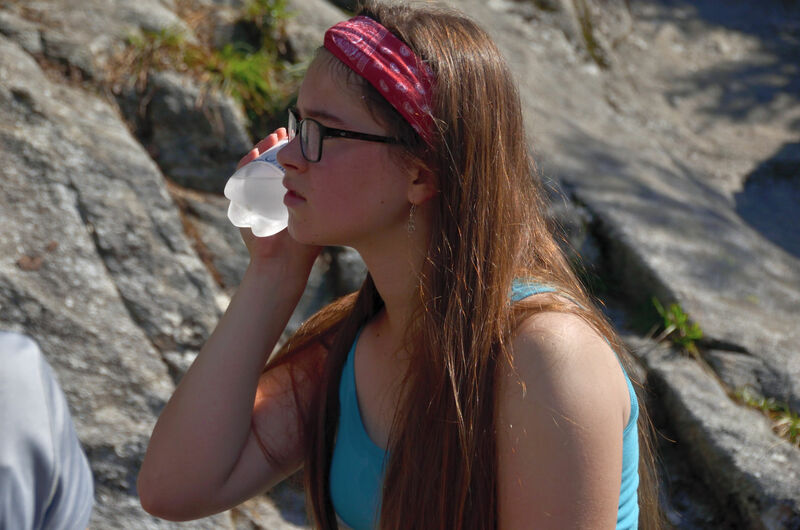 During Fusion’s music camp, where there were 23 Americans teaching music and sport workshops, Elisabeth had the chance to do some translating in a fairly casual setting. Pretty soon some of the Americans were requesting Elisabeth’s help because they loved the way she put emotion into her translations. That was a great confidence builder and so Elisabeth went into the Swiss trip with a good experience (and a little confidence) under her belt. Elisabeth especially enjoyed the ministry with the Roma. Since Elisabeth is at home in both Slovak and American culture, she’s never really had a cross-cultural experience. Working with the Roma was definitely an eye-opener. She marveled at their openness talking about drinking problems or their struggles to be obedient to Christ. She also loved working with the children who were so trusting and quick to build bonds. Between the Nashville and Swiss missions trips, Elisabeth has gotten some great missions experience in at a very young age. And what a summer! She’s certainly being stretched beyond her comfort zone. Speaking of being stretched beyond her comfort zone. 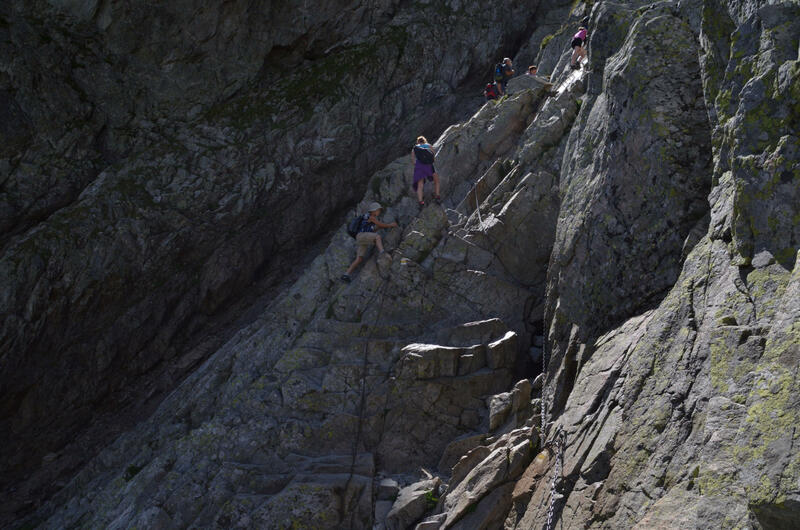 Here’s a picture of Elisabeth climbing in the High Tatras. She’s about dead center in this photo, just above Max. Climbing on the rocks is no big deal for Elisabeth, in fact, that’s her favorite part of the hike. What’s hard for Elisabeth is the one mile of vertical ascent and 15 total miles of hiking. That kind of hiking sometimes brings out her bad side. On this recent climb, however, Elisabeth was first up the mountain (and you can see, she’s quite a bit ahead of Jana and I). From a dad’s perspective, that’s awesome to see. Go Elisabeth! Libby – You amaze me with your quiet talents and how you bubble as you continue to find new strengths for yourself. Love watching your successes from up close and far away. I am going to have Braxton relisten to “Day One” tonight when she gets home from her first high school experience. She was very scared last night to start band camp today and the rest of the week. Also this week, entwined with band camp, is Freshman orientation and volleyball try outs. The message in “Day One” is a good one for this occasion. It will mean even more listening to you sing it. Looking forward to more updates soon. I’d love to have you and Hannah and Sarah doing some worship together, encouraging each other and praising the Lord. Who knows? If you’re back in Nashville in a couple of years, and Hannah goes to Belmont, you guys might be able to hang out together! She’d really appreciate your prayers as to her college choices and applications right now. And I think Sarah understands your relationship with hiking 🙂 We miss you! Very nice. Very talented kids! What great cross-cultural and different language and Christ oriented missions work your family is doing. Love the rock climbing pictures, especially! Thanks for the update. We continue to pray for all of you regularly. I can’t believe how old the kids are already!! They are definitely flourishing!